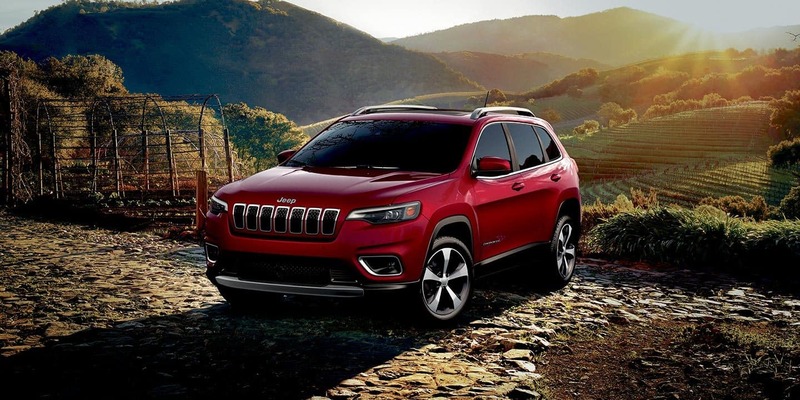 The Jeep Cherokee & the Jeep Wrangler - Which Popular 2019 SUV is Right for You? With so many impressive SUVs to choose from, it can be hard for drivers to decide which Jeep model is right for them. At Anthony D'Ambrosio's Chrysler Jeep Dodge Ram, we're proud to recommend all of our stellar Jeep brand SUVs, but we also understand that the various styles and capabilities available appeal to different personalities and driving styles. In our continued effort to help our customers in the greater Elverson area choose the perfect vehicle for their needs, we've put together in-depth analyses of some our most popular vehicles. Here, you'll find a side-by-side comparison of the Jeep Wrangler and the Jeep Cherokee. We hope it helps you understand both models a little better, and that it helps guide you to your perfect fit. Configurations. While the 2019 Jeep Cherokee is strictly a five-passenger, four door model, the 2019 Wrangler is a bit more customizable. Two styles are actually available for Wrangler, including a two-door version that seats up to four people, and a four-door version that seats five. Exterior design. While the compact Jeep Cherokee is a sleek, sporty-looking SUV with optional sunroof, the Wrangler is renowned for its convertible body style. 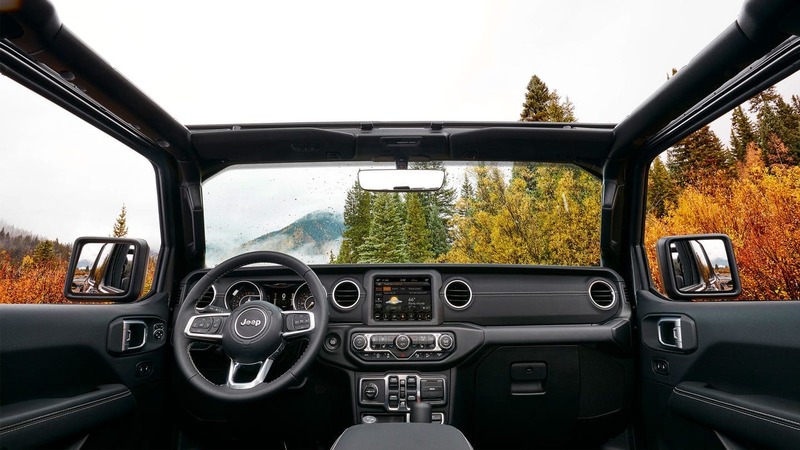 Drivers choosing the Wrangler can get either a removable cloth top or a removable hard top, giving it top-down, wind-in-your-hair appeal for drivers who like summertime adventures. Interior dimensions. The 2019 Jeep Cherokee offers a slightly more spacious ride than the Wrangler. 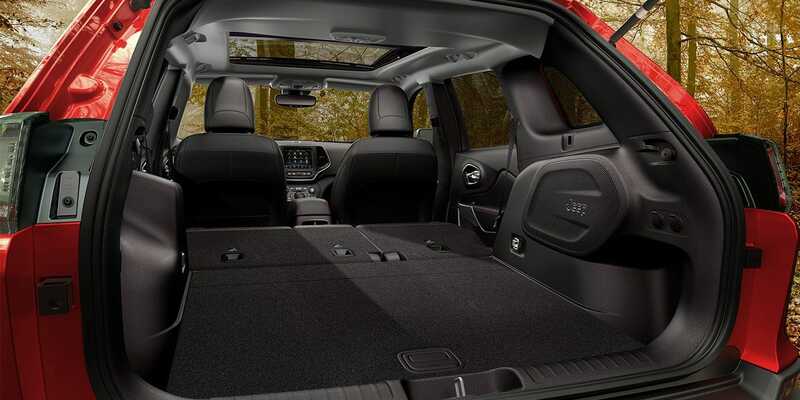 The Cherokee has more than 40 inches of backseat legroom, while the Wrangler has around 38 inches of rear legroom. Cargo space. When it comes to hauling groceries or sporting equipment, the Wrangler offers 31.7 cubic feet of rear cargo space, compared to the Cherokee cargo hold, which accommodates up to 24.6 cubic feet. Engine options. Both Jeep SUVs offer drivers one standard engine and optional engines for more power. However, the Cherokee offers three possible powertrains, while the Wrangler has just two. This is up from previous model years, though, when the Wrangler was only available with a V6. Jeep added a turbocharged four-cylinder for model year 2019, which means drivers considering both SUVs now get the option of choosing other engines. Capability. 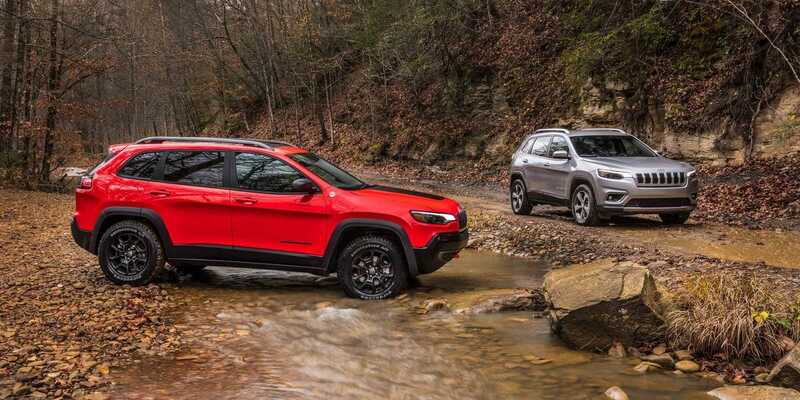 As Jeep brand SUVs, both the 2019 Jeep Cherokee and the 2019 Jeep Wrangler exhibit off-road prowess that other SUVs simply can't match. Both SUVs have trim levels that offer luxury features and creature comforts, and both have specific trims that are tuned for exciting, off-road jaunts. Standard features. The Jeep Wrangler is also customizable in that drivers can get it with as many or as few creature comforts and tech amenities as they want. The entry-level Wrangler has removable front doors, windows that manually crank, manual locks, and optional air conditioning, while upper-level trims get full power accessories and the latest feature for tech and communication. Meanwhile, the Jeep Cherokee starts off a little more luxuriously, with standard air conditioning and standard power accessories. Safety features. Both SUVs come equipped with a similar roster of safety features, including standard 4-wheel ABS and a standard rearview camera. Plus, additional, advanced safety features are available as you move around through the various trim levels. Can't Decide? Test Drive Both the Jeep Cherokee & Jeep Wrangler in Elverson, PA! The best way to determine which Jeep brand SUV works best for your needs, is to meet and test drive both of them in person. Stop by and visit us on Ridge Road, and let our sales team introduce you to both high-quality Jeep models soon and get started on your journey towards a new vehicle you'll love.